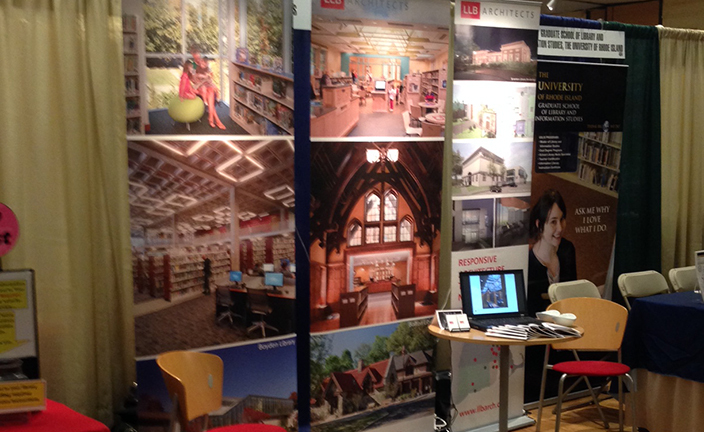 October 19, 2016 – LLB Architects took part in the New England Library Association’s Annual Conference again this year. For over ten years, we have been an exhibitor at one of the largest library-focused events in New England. This year’s three-day conference took place from October 16 – 18 in Danvers, Massachusetts. The theme of the conference was “Imagining Tomorrow”. We had the pleasure of meeting so many wonderful librarians from around New England and discussed the potential for growing and renewing their libraries. If you attended the conference and didn't get a chance to stop by our booth, please get in touch with us and let us know how we can help you plan for your library in the future. Call us at 401.421.7715 and ask to speak to our principal in charge of library planning, Drayton Fair. See you next year in Burlington Vermont! Check out the NELA website and the NELA Conference website for more information.